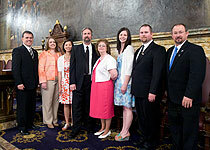 Rep. Moul with members of Officer David Grove’s family at the Capitol today. Moul’s bill to honor the slain Wildlife Conservation Officer passed unanimously in the House. The House today passed legislation sponsored by Rep. Dan Moul (R-Adams/Franklin), designating the bridge that crosses Marsh Creek and connects Freedom and Cumberland townships in Adams County as the Wildlife Conservation Officer David L. Grove Memorial Bridge. Grove, formerly of Fairfield, Adams County, had served as a wildlife conservation officer for about 10 years in Franklin and Adams counties before he was killed in the line of duty in November. House Bill 1255 passed by a unanimous vote and now goes to the Senate for consideration.